Amsterdam, Rotterdam, Utrecht, Groningen, Volendam, and more! Explore the beautiful Netherlands and find out more about the gay scene in Amsterdam, Rotterdam and more. Tradition and innovation intertwine here: artistic masterpieces, centuries-old windmills, tulip fields and romantic candlelit cafés coexist with visionary architecture, cutting-edge design and phenomenal gay nightlife. The Netherlands (or sometimes called Holland) is a very liberal country. It was the first to legalize gay marriage in the world. • Arrival transfer from airport to your hotel. Amsterdam has frequently been named one of the most LGBT-friendly cities in the world, and gay travelers will quickly enjoy the freedoms of living in one of the world's most culturally liberal countries. There is a lot more to love in Gay Amsterdam than the many many gay bars, saunas, cruise clubs, dance parties and LGBT events – travelers can marvel at the golden age canals, iconic tilting gabled merchant houses, intriguing museums, vintage shop, creative design studios and the infamous Amsterdam coffeeshops. 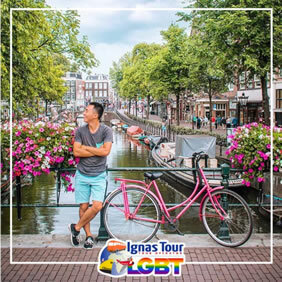 • Buffet Breakfast and discover the vibrant city of Amsterdam together with our LGBT Friendly Tour Guide and explore some of its most famous symbols like the Red Light District, the spectacular charming Jordaan District and the hidden Begijnhof. Learn more about the birth of the city on the river Amstel to the glorious Golden Age. • Observe Amsterdam's Canals which became a UNESCO World Heritage in 2010 and they are formed by draining swampland to create a canal network of concentric arcs. • Reach the breathtaking Dam Square, home to the Royal Palace and 15th-century Nieuwe Kerk where many Dutch naval heroes are buried. • Lunch on your own. • In the afternoon free time for individual visits and shopping. • In the late afterrnon enjoy a beautiful Amsterdam Canal Cruise. 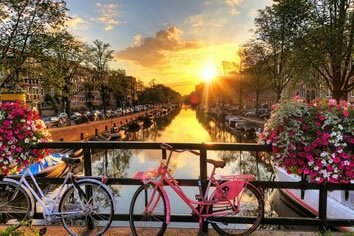 • Dinner on your own and overnight at your hotel in Amsterdam. Rainbow Tips: One of the main gay streets in Amsterdam. Reguliersdwarsstraat is home to excellent gay bars, restaurants and shops. 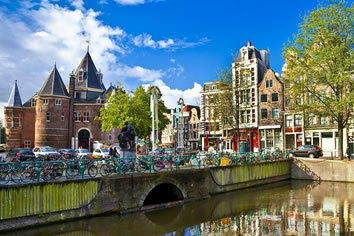 More authentically Dutch gay venues and cafés can be found around at the nearby Amstel area. • Buffet Breakfast and departure by Car or Minibus to Aalsmeer to take a look to the vibrant flower auction and see the vividly hued blooms for which Holland is so famous. • Alternatively, during the flowering season (April until mid-May), we'll enjoy an included visit to the tulip fields of Keukenhof - the mesmerising sight of several million flowering bulbs planted across a 70-acre will leave you in absolute awe. • In the afternoon, travel through The Hague and to the historic town of Delft to visit the Royal Delft Pottery workshop for a Cultural Insight into the manufacturing of this delicate hand-painted blue and white porcelain. • Continue to edgy Rotterdam. Free time. In the evening enjoy a special Rotterdam Harbour Cruise Tour. • Dinner on your own and overnight at your hotel in Rotterdam. 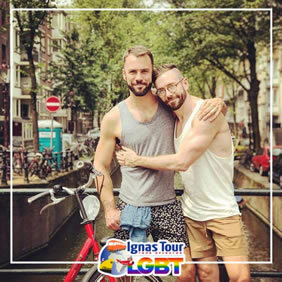 • Buffet Breakfast and be ready for an extraordinary walking city tour of Rotterdam with your LGBT Friendly Tour Guide. • Take a look to one of the most fascinating projects in post-war Rotterdam, the captivating cubic houses of famed architect Blom. Blom considered his designs as an abstract tree and the entire 38-cube complex as a dense urban forest, and his imaginative architectural approach is one of the highlights of this tour. • Continue your walk through Rotterdam's old harbor and pass the central shopping area. See the few historic building that survived the war: the post office, townhall and Laurens Church. • Another highlight is the impressive Market hall, which is the first covered market in the Netherlands. It is a place where good food and unique housing are harmoniously combined in a spectacular arch. This iconic fresh market opened for business on 1 October 2014, after five years of construction. • Lunch on your own and continue to Utrecht by train. • Accommodation at your hotel. • Afterwards, enjoy a special LGBT Friendly Tour of Utrecht. • Stroll through Utrecht and get to know its main attractions and hidden corners. Visit the cathedral tower, the tallest church tower in the Netherlands, the cathedral and the picturesque cloister next door, where the history of Utrechts began with a Roman fortress. • From the famous Utrecht church cross from the Middle Ages parts are preserved and Utrecht has the city palace of the only Dutch pope, Hadrian VI. The court of the Abraham Dole convent awaits you with its peculiar history. • The oldest canal of Utrechts, the Oudegracht, has been an important life-line since 2000 years and is characterized by more than 700 dockyard. Wise neighbors let the vaults here, thus providing for a still alive variety on the canal. • Be amazed at the history of the hermit Suster Bertken at the Buurkerk and learn about the importance of trade across the river with areas up the Rhine and far out of town. Listen to the role played by Vredenburg and why the brewer's wife Trijn van Leemput became a heroine of the city. • Near the Mariaplaats, where the tour ends, there are, as well as remains of a Romanesque cloister, a hidden corner where Catholics secretly exercised their faith in times when it was officially forbidden under a Reformed regime. • Dinner on your own and overnight at your hotel in Utrecht. • Buffet Breakfast and departure by train to scenic Apeldoorn and Het Loo Palace, the former royal residence built in 1685 with its immaculate Baroque Dutch gardens. • Our next stop is the traditional village of Staphorst, where you will have an opportunity to experience first-hand the traditions of Holland and see the locals walk by in their traditional dress. • Lunch on your own during the itinerary. • Afterwards travel to Groningen once one of the most powerful cities in the Netherlands. • Free time int the city for individual visits and shopping. • Dinner on your own and overnight at your hotel in Groningen. 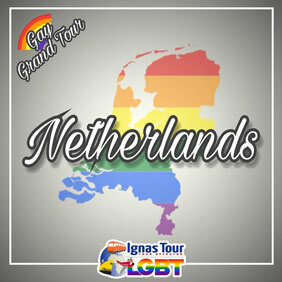 • Buffet Breakfast and be ready for an amazing LGBT Friendly walking Tour of Groningen with a cultural insight thourgh its medieval centre. • Ramble along the city's picturesque ring of canals like a local. • Continue then to Volendam where you will have time for lunch on your own, a former fishing port on the edge of Ijselmeer. Learn about the craft of wooden clog making and Dutch cheese during a fascinating Cultural Insight. 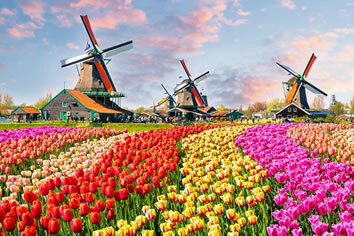 • Afterwards stop in Zaanse Schans, an open-air museum full of traditional Dutch handicrafts and culture. • Finally back to Amsterdam. Free time in the city. • Breakfast in the hotel and transfer to the Amsterdam airport. Situated in the heart of Amsterdam’s city centre, Hotel The Exchange is an independent fashion hotel that playfully weaves together hotel design with fashion in unique rooms. Free WiFi is offered and hotel varies from budget to five star rooms. Dressed as if it was a body, each room is uniquely decorated by Dutch top designers. Flat-screen satellite TV is provided. The modern bathroom comes with a bath tub or shower. The Exchange includes a 24-hour reception and a ticket service. Guests can enjoy breakfast all day at the on-site Stock café. Hotel The Exchange is 300 m from Dam Square. Amsterdam Central Station is only a 5-minute walk from the hotel and offers direct connections by train, tram and metro all over the city. Hotel The Exchange is a 5-minute walk from the shopping street Kalverstraat as well as the Nine Streets area, the Jordaan district, and the Anne Frank House. Situated in the heart of Rotterdam, Holiday Inn Express Rotterdam – Central Station is right next to the city centre shopping area. This hotel features soundproof and spacious hotel with free Wi-Fi. All rooms in Holiday Inn Express are equipped with an LCD TV with international channels, tea and coffee making facilities and air-conditioning. Each room has an en suite bathroom with a walk-in shower. Guests can enjoy a drink at the bar and snacks, sandwiches and drinks can be bought from the vending machines in the lobby. Guests can also eat out at one of the restaurants in the surrounding area of the hotel. This hotel is located next to the central station of Rotterdam, which easily connects you to different parts of the city. The Euromast Tower is a 20-minute drive away by public transport and the Holland Casino is only 300 m from the hotel. NH Centre Utrecht Hotel offers stylish hotel in a unique 19th century building. Many of its guest rooms still have original stained glass windows. Each of the fully-equipped, spacious rooms come with lovely views and free Wi-Fi. All of the rooms have a private bathroom. Guests can enjoy late check-outs. The ground floor under NH Centre Utrecht houses café Broers and Luden Restaurant. Guests can enjoy an extensive menu, from a champagne brunch to Dutch and international cuisine. The famous Dom Tower is located a 5-minute walk away from NH Utrecht Centre. On Saturdays, Utrecht's flower market is held right in front of the hotel. This design hotel offers newly renovated and elegant rooms and is situated directly to the Hoornsemeer. It includes an heated indoor swimming pool and a spacious garden. Best Western Hotel Groningen Plaza is also situated next to highways A7 and A28 and they offer free parking. Free WiFi is offered. All of the modern rooms at Best Western Hotel Groningen Plaza have a flat-screen TV and a work desk. The hotel's restaurant Meerwold serves elegant gourmet cuisine with international influences. The restaurant serves lunch and dinner featuring seasonal products in a informal surrounding. Guests can book a 3-course dinner, or they can also relax at the bar with a drink. The surrounding area offers multiple walking trails and cycling trails, and there is a nature reserve in the vicinity.